Fence panels & trellis if you so desire. Concrete Posts – It is important to remember to allow for extra length to be sunk into the ground (60cm) and also enough, if you have trellis as well. 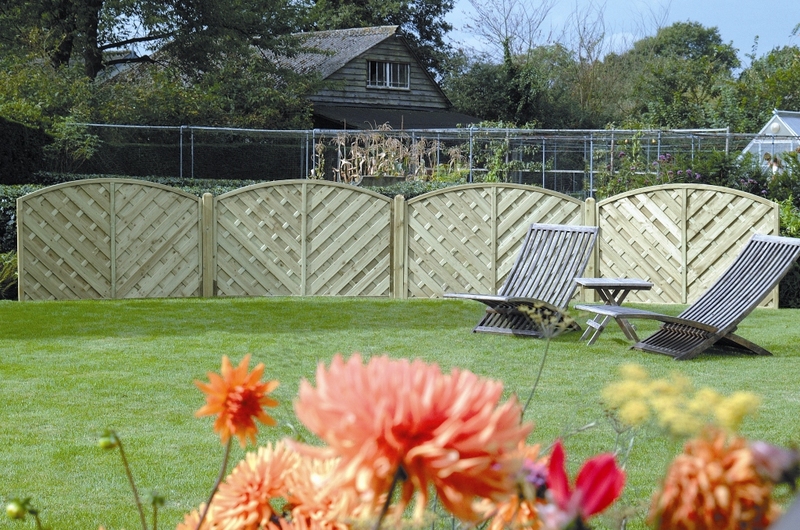 A friend – is a good idea to help you hold fence panels in place. If you have to demolish an old fence, make sure it is yours in the first place, check your boundary lines to make sure that you are responsible for the fence, or you have permission from the person who is. Then using string and wooden pegs mark out the lines along the boundaries, making sure everything is straight, a good idea would be to put pegs were you intend to put your Concrete Posts. Dig out the hole for your first concrete post, the hole should be appro­ximately 60cm (2ft) deep, but this depends on the quality of the ground, the looser the ground, the deeper/larger the hole would have to be. Place the Concrete Post in the hole. Use rubble or bits of brick to keep the Concrete Post in place while your pour your Post Mix and it sets. Mix your Post mix as per the instructions on the bag. Pour the mix into the hole and wait for it to set, make sure you straighten up your post with a spirit level before the Post Mix sets. Once the concrete holding the first post has set, Make sure you mark out the position of the next post, make sure you don't make the space to tight that you cant remove the Fence Panels in the future, but not too loose that the Fence Panel could fall out. Now its time to dig out the hole for the second Concrete Post, once you have dug it out, slot your Base Panel and Fence Panel into the first post, then place your second concrete post in the hole, making sure it lines up perfectly the the Fence Panel and Base Panel. Although you don't need to use a Concrete Base Panel, having one would stop the Timber Panel resting on the floor, reducing the chance of rot. Now you have roughly lined up your second post, fill the hole with stone or bricks to keep it upright, all the time making sure it is level and lines up with the panel, then fill the hole with the post mix, making sure that the post is level and straight with the Fence Panel. Repeat along the rest of the boundary. Repeat this process until you have completed the length of the garden or are you wish to cover, all the time following your line marker and making sure the the Concrete Posts are straight and upright.